These photos were taken every five minutes starting when the sun was already partially eclipsed and ended a few frames before it set because at the tail end the sun hit some clouds, poor thing. 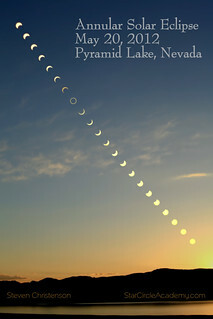 The sun photos were actually taken every 30 seconds and here I've selected every tenth one. The background photo was taken just after sunset with the camera still pointed in the same location. 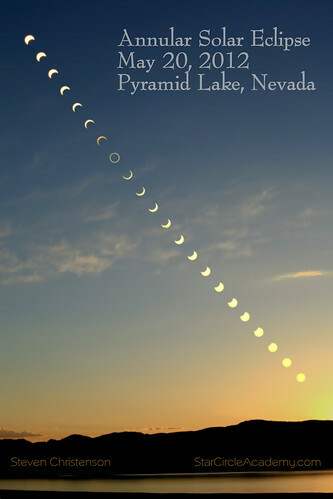 In the foreground at the bottom is Pyramid Lake, Nevada where the path of maximum annularity crossed. And no, we weren't part of the Hippy Hoedown taking place to our North. Details about planning (and processing) appear on my BLOG. Canon 5D Mark II with 70-200mm lens at 70mm with Baader Astrosolar Filter. All rights reserved. Curious what "all rights reserved means?" it means that without written permission you may not: copy, transmit, modify, use, print or display this image in any context other than as it appears in Flickr.